Today was the first game of the Pelicans since Anthony Davis’s request to be traded. They could have easily crumbled and gave up today against the Rockets. Instead, they showed New Orleans resilience and took down Houston. The Pelicans overcame an early deficit and took over late to send a statement to Davis. Leading the charge is Jahlil Okafor, the man who replaced Anthony Davis in the starting line-up. Okafor has bounced around the league as a remnant of a lost era. The back-to-the-basket big man was considered a bust because he couldn’t keep up with the fast-paced, heavy-shooting trend in the league. He eventually made his way to New Orleans where he’s gotten limited minutes, playing behind Davis, Julius Randle and Nikola Mirotic. With Davis’ injury, an opportunity opened for Okafor to prove that he’s more than a bust. And he ran away with the chance. In his last five games, Okafor has replicated Davis’ numbers with a 21-11-2 statline. Against the undersized Rockets, Okafor threw his weight around the paint and finished with 27 points and 12 rebounds. This a good reminder that Okafor is a former third pick. He’s only 23 years old. With the Pelicans set to lose a top pick in the next few months, it’s good to know that there’s young, lottery pick waiting in the wings to take his place. 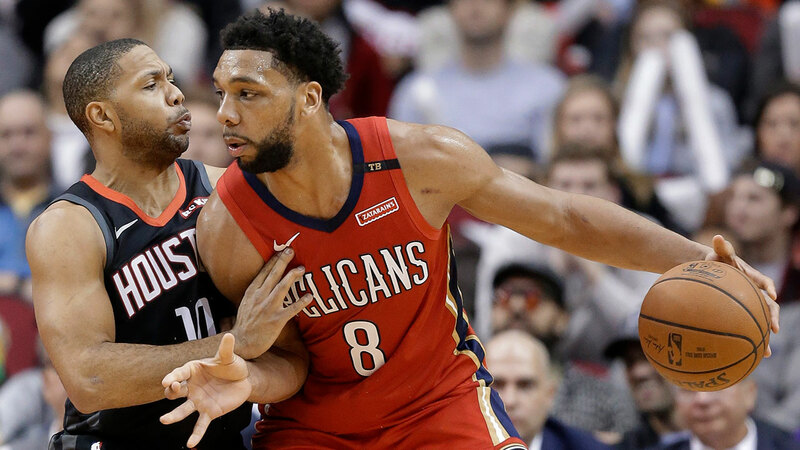 If Okafor can continue to blossom for the Pelicans, it makes it easier for New Orleans to rebuild. They can focus on other positions of need knowing that the big man’s role is secure with Okafor manning the post. With 24 seconds left, the Spurs had a chance to ice the game. All they needed to do was secure the inbound pass, wait to be fouled and make their free throws. In moments like these, it pays to have an All-Star closer to finish off a plucky lottery team. Unfortunately for the Spurs, DeMar DeRozan, their go-to guy in the clutch was out due to an injury. So San Antonio had to make do. They inbounded the ball to Marco Belinelli who was immediately double-teamed. The ball was stripped and Josh Jackson took the ball all the way to the other end for the game-tying dunk. With 19 seconds left on the clock, San Antonio still had a chance to win the game. Again, another moment for DeRozan. But again, the Spurs had make do. Rudy Gay waited for Patty Mills to bring the ball to half court and immediately asked for it. He faced up against Josh Jackson near the top of the key and killed time. LaMarcus Aldridge set the screen forcing a switch. That left Kelly Oubre one-on-one against Gay on the left side of the court with three seconds to play. Gay dribbled inside the arc, rose up and fired a jumper over the defense of Oubre. The ball hit back iron and in as the lights went off. Gay nailed the walk-off jumper to lift the Spurs past the Suns. It wasn’t the prettiest of games but the Spurs made do. That’s been the story of the season for the Spurs. They’ve been improvising and putting together wins with the personnel that they have. That includes Gay who found a home in San Antonio as a role player. This season he’s averaging 14.3 points and 8.4 rebounds on 52% shooting. The Spurs are currently at 30-22, good for sixth in the West. For a team that lost Kawhi Leonard in the offseason and struggled to start this season, that record and that standing at this point, will do. Several players from East teams auditioned for coaches for a spot in the All-Star Game. The Wizards may have lost to the Cavaliers but Bradley Beal continued his hot streak. He finished with 31 points and seven assists. Nikola Vucevic continued his monster run. He had 27 points, 11 rebounds and five assists in a loss to the Thunder. D’Angelo Russell’s breakout season continues to load. He led the Nets to a win over the Bulls with 30 points and seven assists.